The Special Collections and Archives department of the Auburn University Libraries works to preserve the history of Auburn University and its alumni. Special Collections serves as the official repository of the University and also features a wealth of books and items that require special care. 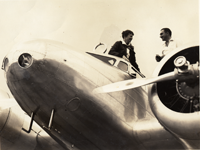 The department has recently taken on the project of digitally preserving some of its items, including the Everett Leavins Collection that can be viewed online here. Many historical items in our possession have come from our alumni. Auburn University Libraries gratefully accepts gifts in-kind. Donors are encouraged to e-mail Harrison Mills at rhm0006@auburn.edu or call (334) 844-8647 for information about giving materials to Auburn Libraries. Special Collections and Archives enriches the Libraries with wonderful historical collections that cannot be experienced elsewhere. If you are interesting in donating an item or collection please contact our Development Officer.